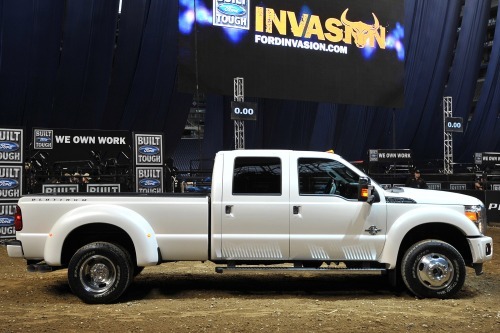 Standard equipment on F-350 DRW with 6.2L engine. Standard equipment on vehicles with 6.7L engine. Optional code for F-350 SRW with 6.2L engine. Dealers ordering a vehicle with a 6.2L engine without a California or 50-State Emissions System and which is being sold/delivered to a California Emissions State (CA, CT, MA, MD, ME, NY, OR, RI or VT) dealer are also required to use Code 423 to attest either that the vehicle is not being registered in a California Emissions State or that Code 936 is applicable. Note: In Maine, Rhode Island and Vermont, dealers cannot use Code 423 for customers outside of California Emissions States locations (except Public Service/Emergency Vehicles - Code 936). Required code for California Emissions States (CA, CT, MA, MD, ME, NY, OR, RI or VT) registration for vehicles with 6.2L engine (other than F-350 DRW); optional code for Cross Border State (AZ, DC, DE, ID, NH, NJ, NV, PA, VA, WA OR WV) dealers. Federal Emissions State dealers ordering a California Emissions System (Code 422) are also required to use Code 93N to attest that the vehicle is to be registered in a California Emissions State. Note: It is a violation of Federal law for a Federal Emissions State dealer to sell a vehicle with a California Emissions System for registration in a Federal Emissions State, unless the vehicle also meets EPA standards (i.e. 50-state emissions). Hardened engine intake valves and valve seats; Bi-Fuel manifold; This package does not include CNG/LPG-fuel tanks, lines, etc. Vehicle will be equipped with the standard factory gasoline fuel system. Additional equipment combined with Certified calibration reflash is required, from an external upfitter, to convert the vehicle to a CNG/LPG fueled vehicle. Ford Motor Company does not provide an exhaust or evaporative emissions certificate with this option when converted to use CNG or LPG-fuel. Ford does not represent that a vehicle converted to use CNG or LPG will comply with all applicable U.S. or Canadian safety standards. It is the responsibility of the final stage manufacturer (body-builder, installer, alterer or subsequent stage manufacturer) to determine that any vehicle converted to use CNG or LPG complies with U.S. Federal, California or Canadian exhaust and evaporative emission requirements, Federal fuel economy standards, U.S. and Canadian safety standards, labeling and any other requirements.